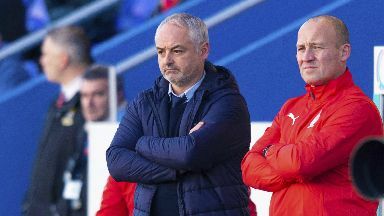 The Championship side maintain there was no wrongdoing in the appointment of Ray McKinnon. Falkirk have lodged an appeal against the SPFL's ruling that they broke rules in the appointment of manager Ray McKinnon. An independent tribunal convened by the league found that the club acted improperly before McKinnon left his job as Morton boss to take the reins at Falkirk after just three months in charge in Greenock. Morton made their displeasure known and alleged that Falkirk had talked to McKinnon before making any approach to the club. The matter was taken on as a disciplinary case by the league and an SPFL board sub-committee determined that the Bairns "failed to comply with rules related to the employment of the current management team". They were last week slapped with a £60,000 fine, with £20,000 of the penalty suspended. Falkirk have now taken their appeal to the Scottish FA, maintaining their innocence and hoping to have the decision overturned. A club statement read: "Falkirk FC has lodged an appeal with the SFA Judicial Panel in regards to the SPFL Independent Tribunal's decision relating to the hiring of our current management team from Greenock Morton FC. "We remain in constant dialogue with our legal representatives and would like to reassure our supporters that we will continue to challenge what we feel necessary to act in the best interests of our management team and club. "The full focus of our management staff remains on preparing the team for another important Championship fixture at Alloa on Saturday and we thank our supporters for their ongoing continued and outstanding backing for Ray, Darren and the players."